Some time ago, before we launched into these recent website renovations, I wrote in here about the British version of The Guardians Trilogy and how, yet again, a publisher had changed the title of a series. At that time, two of the novels had been published in Britain, with The Forest Laird renamed to REBEL and The Renegade issued as RESISTANCE. The third book in the series, The Guardian, had not yet been named at that time. 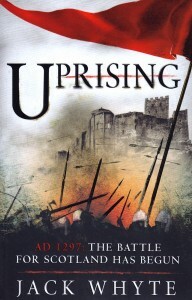 The third book, issued here in Canada as The Guardian, has now been renamed and released in Britain, with the title UPRISING, and once again the reason for the change makes sense in the British market. 2014 marked the 700th anniversary of Bruce’s great victory over England’s barons at the battle of Bannockburn, and it was supposed to be a massive celebration of Scotland’s national identity, with a huge Homecoming celebration planned for returning migrants visiting from other countries. It was sidetracked, though, virtually derailed by the unforeseen national referendum on separation from the United Kingdom, and nothing much came of either celebration internationally.